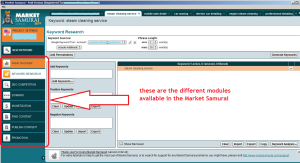 I found Market Samurai ‘by accident’ good 3 years ago. In my opinion, it is the best SEO tool for keywords research and rank tracking there is out there. Instead of giving you background info what built-in modules it has, here’s a print screen of the program. I am a marketing consultant but as you can imagine, so are many other freelancers. So I had to find a related niche to shine despite the lack of reviews and feedback from clients. And SEO was just that because of the many freelancers offering cheap but low quality labor.